Sony Xperia Z pricing details leak - Gadgets Info. 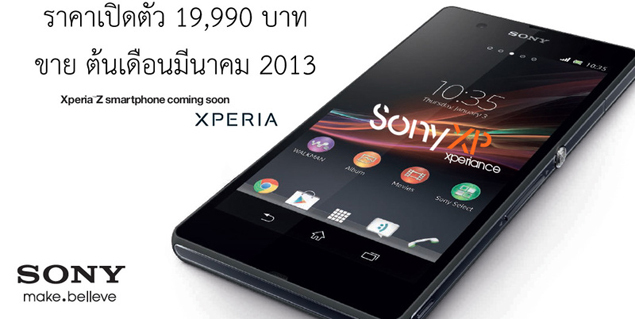 In the latest set of leaks with regard to the Sony Xperia Z (aka Sony Yuga C660X), Unwired View reports that the pricing details of the device have cropped up in an ad on a Thailand forum. The details reveal a Thai pricing of 19,990 Baht, which translates to about $660 or 500 euros or Rs.36,000 rupees. The tech blog notes that while the current pricing is specific to Thailand, prices in other regions will vary depending on Sony's global pricing strategy. This is not the first time we've seen an expected pricing for the device. We reported earlier that the Xperia Z is scheduled to go on sale in China on January 15 for around 4,298 CNY ($690 or €520). The rumours surrounding the Xperia Z's existence, however, have been around for quite a while now. The first round began with a set of benchmark leaks, where Sony was rumoured to be working on a 5-inch device codenamed Odin or Yuga. Then came the device's specs while it was still named the Sony Yuga C660X. This was followed by the smartphone's name change to Sony Xperia Z and the fact that it will debut at CES this year. Next set was a series of image leaks for the device in the form of press renders until it was finally spotted on Sony's official website confirming the device's existence for real. Apart from this, the Sony C650X Odin was also seen alongside the Xperia Z and though it was earlier rumoured to be named as the Xperia X, the device is now expected to debut as the Xperia ZL, a slightly thicker, heavier, but smaller version of the Xperia Z. To recap, the Xperia Z apparently sports a 5-inch 1080p (1920 x 1080 pixels) display at 440ppi with Sony's Mobile Bravia Engine and runs on Android 4.1.1 Jelly Bean. It is powered by a Qualcomm Snapdragon S4 Pro quad-core processor with 2GB RAM and 16GB internal storage, which is expandable by another 128GB. Other features include a 12-megapixel rear camera (as opposed to the 16-megapixel mentioned earlier), Micro-USB as well as USB host mode, 802.11 a/b/g/n in both 2.4GHz and 5GHz modes, Bluetooth 4.0, LTE and NFC. There are also rumours of another mid-range Android smartphone from Sony, the C5303 codenamed HuaShan. Mentioned a few days ago by the Xperia blog, the device apparently will be part of a C530X series, alongside the C5302 and C5306. Many countries, including China, could witness the launch of the device. Looks like we will have to wait it out until CES 2013.